We take a look back at Eero Saarinen's iconic design—and one of his last. At age twelve, Eero Saarinen won his first design contest, illustrating a story entirely with matchsticks for a Swedish newspaper. The prize was 30 Kroner, or $8. The Finnish born architect grew up surrounded by design. His father was a well-known architect and his mother was a talented sculptor and textile maker. A young Saarinen played under his father’s drafting tables and was drawing nudes by age ten. 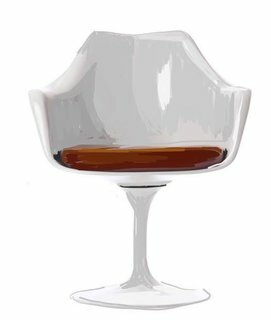 The Tulip Chair consists of a reinforced plastic and aluminum stem with a curved fiberglass shell. After studying architecture at Yale, he followed in his father’s footsteps and joined the family firm. When Saarinen submitted the winning design for the St. Louis Gateway Arch, the prize money was accidentally sent to his dad. Though his architectural feats garnered serious recognition (and a spot on the cover of Time magazine in 1956), his furniture ranks among the most celebrated of the twentieth century. 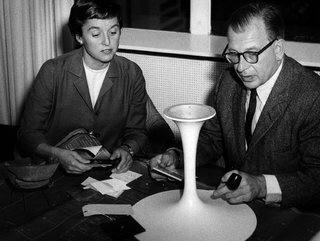 Saarinen at work on the Pedestal model. He started with hundreds of drawings, and moved on to ¼ scale models, which were then set up in a room the size of a dollhouse. 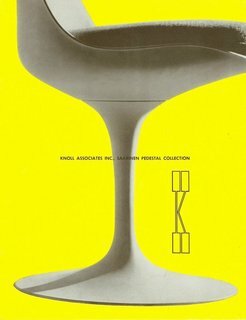 One of America’s leading modernists, Saarinen designed the Pedestal Collection to alleviate the clutter of American homes. "The undercarriage of chairs and tables in a typical interior makes an ugly, confusing, unrestful world. I wanted to clear up the slum of legs. I wanted to make the chair all one thing again," he said. Unfortunately, creating a single piece of molded material was technologically impossible at the time. A reinforced plastic and aluminum stem supports the curved fiberglass shell of the Tulip Chair. The collection, which features the chair, tables, and a stool, was his last one; he died of a brain tumor in 1961. Thankfully, his sculptural nod to the future of design has lived on. 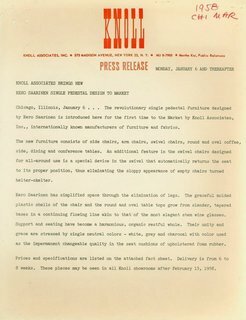 The arrival of the Pedestal collection was celebrated in this 1958 Knoll press release. 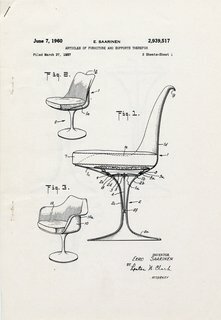 Though Saarinen completed the design in 1956, the patent drawing for the Tulip Chair was filed on June 7, 1960. An early ad for the Pedestal Collection highlights its curvilinear form. 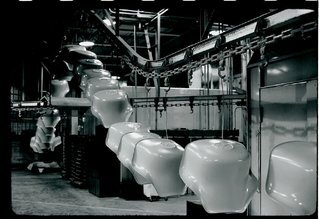 An archival shot of the Tulip Chairs in production at the Knoll factory. 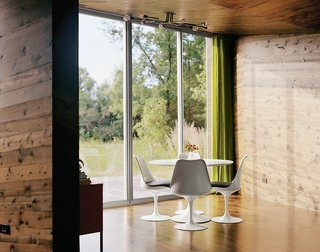 A Chicago couple selected the Pedestal Collection for the dining space in their rural Illinois weekend home. With such a strong form, Tulip Chairs work well amongst various aesthetics. 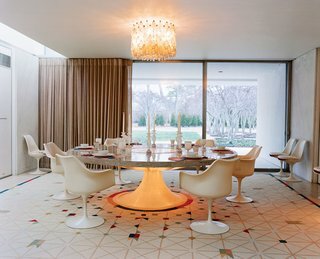 The Miller House, a National Historic Landmark in Columbus, Indiana, was designed by Saarinen in the 1950s with the help of Alexander Girard and Dan Kiley. 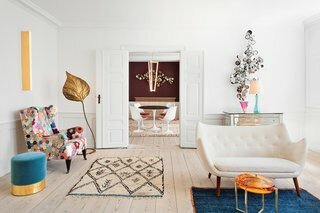 In an apartment turned showroom in Copenhagen, dark red walls set off the dining room’s Pedestal Collection. A set of armless Tulip Chairs honors a family legacy in the Director’s House at the Cranbrook Campus. Eliel Saarinen, Eero’s father, designed it.